Super graphic and colorful at Marc by Marc Jacobs. From the Marc by Marc Jacobs Spring 2012 collection. See all the looks on style.com. Perfectly floaty at Luca Luca. From the Luca Luca Spring 2012 collection. See all the looks on style.com. Strong primary colors with shots of black. Loved these strong looks from Monique Lhuillier. From the Monique Lhuillier Spring 2012 collection. See all the looks on style.com. 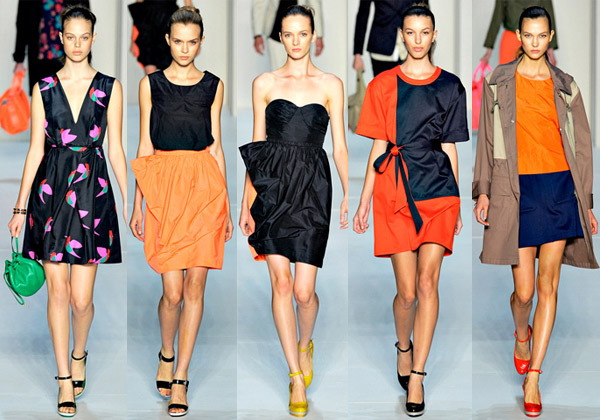 From the Juan Carlos Obando Spring 2012 collection. See all the looks on style.com. Very sweet at Jill Stuart. From the Jill Stuart Spring 2012 collection. See all the looks on style.com. Geometric details and interesting draping at J.Mendel. From the J.Mendel Spring 2012 collection. See all the looks on style.com.